Now that the frenzy of CES is over, it seems a fitting time to look back over all the great products and solutions that unveiled at the electronics show. There’s no doubt that the star of the show was Amazon Alexa and other voice-controlled devices, but one type of technology rose far above the rest in terms of innovation and usefulness: Z-Wave. Below, we cover some of the success of Z-Wave technology at CES and some of the truly fascinating products that were featured there. At CES, more than 35 Z-wave companies showcased their latest devices throughout the Z-Wave Pavilion, a 3,500 square foot area hosted by the Z-Wave Alliance. The Z-Wave Pavilion was packed with excited homeowners and integrators exploring all the unusual ways they can make life easier with technology. We can’t let this opportunity pass without talking about our absolute (and admittedly biased) favorite part of CES 2017: unveiling our smart water leak prevention system! 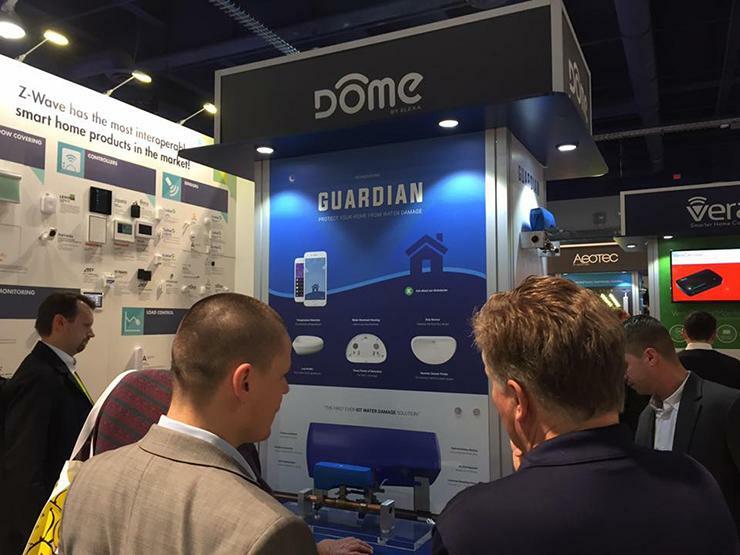 Guardian by Dome is a standalone system that allows you to completely eliminate the risk of a water leak wrecking your home. No plumber or tools required, this system is as simple as taking the devices out of the box, placing them, and then opening up the app. It also works with either Wi-Fi or Z-Wave, so it’s easy to include in an existing smart home system. NEEO’s smart remote launched in 2015 after an incredibly successful Kickstarter, but CES 2017 offered an opportunity for consumers get to up close and personal with the device. The remote pairs with a NEEO hub that allows you to control your Apple TV, Sonos system, Nest thermostat, and thousands of other devices, including Z-Wave-based technology. It’s the universal remote that we’ve all been waiting for: a touchscreen device that allows you to manage everything with ease. One of the brilliant things about smart home automation is the ability for your home to react automatically to changing conditions. In its most basic form, this could include a smart thermostat kicking in to warm your home before a cold front or a motorized window shade lowering to stop solar heat gain on a particularly sunny day. But Qubino’s weather station goes far beyond the basics. The weather station collects ten different values that help your smart system keep your home in the ideal environment. Using data on temperature, humidity, rainfall, wind direction, chill factor, and more, all of the Z-Wave technology throughout your home can respond more effectively. Sometimes it’s the small and simple devices that really have the biggest impact on your daily life. The Button by Fibaro is just that: a button that acts as a smart home controller for a specific action, such as starting a scene or turning on the lights. Named as a CES Innovations Smart Home Honoree, this “easy button” is a great option when you don’t feel like pulling out your smartphone and filtering through all the commands. When it comes to designing smart home devices, the golden phrase is “low profile.” After all, few homeowners would sacrifice a clean and simple look for a big and clunky smart device. At CES 2017, Kwikset unveiled Obsidian, which is a really awesome name for a really awesome door lock. With the lowest profile in the industry, Obsidian is the type of smart lock that every homeowner will want. It looks great, adheres to strict security requirements, and is able to integrate with tons of different automation systems via Z-Wave technology. What was your favorite part of CES 2017? Give us a shout out on Facebook or Twitter and let us know!